We’re in canal country now. 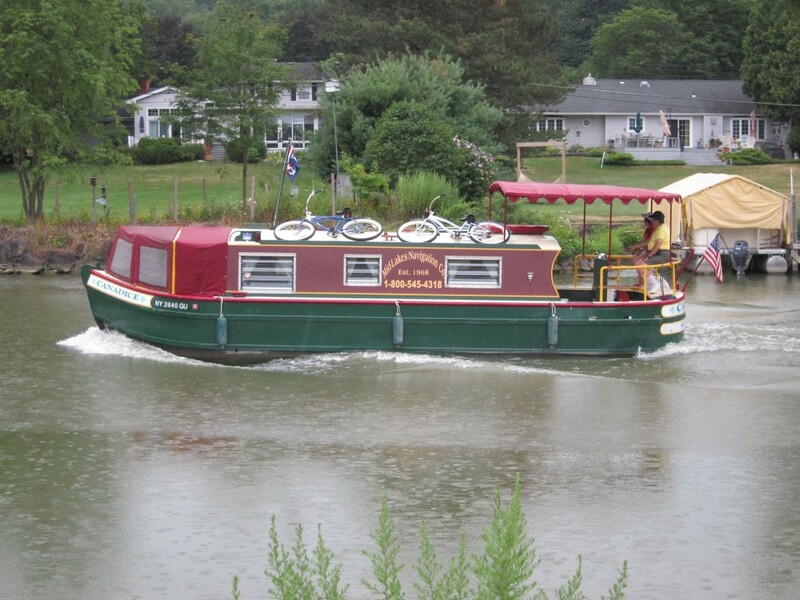 The Erie Canal was the first navigable waterway between the Atlantic (the Hudson River actually) and the Great Lakes. 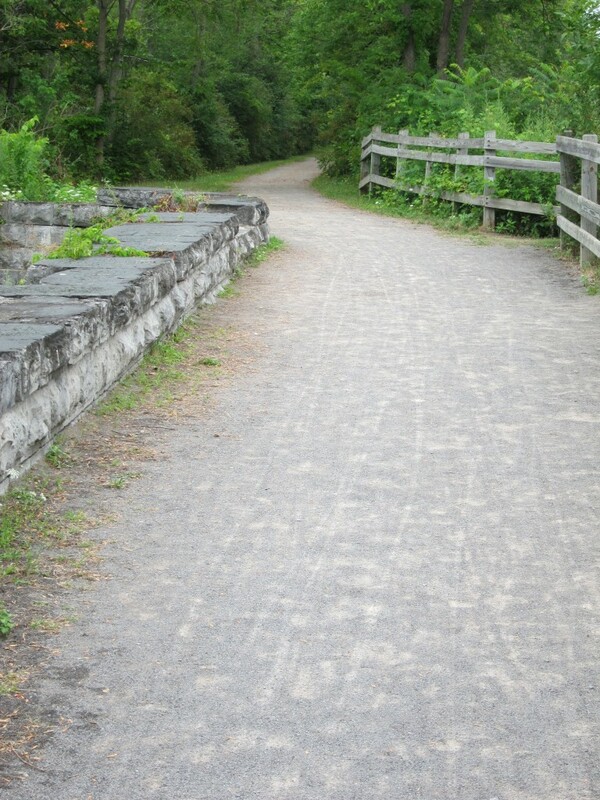 Completed in 1825, the canal covers some 363 miles and rises approximately 600 feet from the Hudson to Lake Erie. Today, we biked about 20 miles of it. It’s a pretty ride and many of the villages along the route are very picturesque. The canal now seems to be given over mainly to pleasure boating and tourist activities though occasionally there is some commercial traffic as well. We pushed off early because we had a near-century day — the last “long” ride of the tour. It was threatening to rain in the early going and then began a slow, steady drizzle — just the kind of rain Suellen loves for her garden. 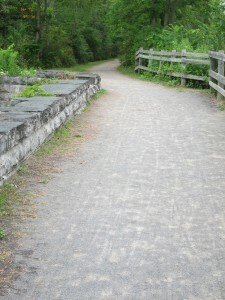 The rain made the canal path — which is hard-packed dirt rather than pavement — a bit of a mess. We soon had fine grit all over ourselves and our bikes — even our water bottles. The path would be a great ride on a sunny day when all you want to do is poke around, look in antique shops, and have a nice lunch. On a rainy day, when you’re trying to cover 95 miles, it’s somewhat less enchanting. The rain refused to relent all day long. By the time we arrived in Liverpool, it was coming down in sheets. Liverpool was founded in the late 1700’s as a center for salt manufacturing. Then it became known as Little Ireland because of all the Irish workers who settled here to work on the canal. Today, it seems to be mainly a bedroom community for Syracuse. Speaking of which, I think it’s time for me to sack out — we have another early start tomorrow. I remember the canal. 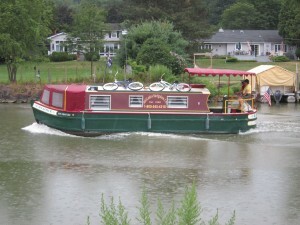 Bill and I took a cruse on it with one of our tours to the east. It was a small boat and we had to spend nights on land.